The mainstream media has dutifully been moving from inaccessible technical units for power, such as the MWh, to a friendlier unit called the "home." I have a smart meter on my home. I have 2 complete years of hourly data from that meter, as well as the hourly data for the province's pricing and demand. Production from industrial wind turbines is one area where the "home" is frequently used as a unit of measurement. Assuming my home was typical, in 2012 the wind turbines connected to the IESO grid has peak production of over 6 million LS; outputting more power than all the homes in the province required during 23 hours (based on 4,354,381 residential customers as indicated here). Because the LS unit changes hourly, the maximum wind production measured in the LS home unit, is usually between 1 and 4 am.when the LS is sleeping; wind output was below 10,000LS 69 hours in 2012. Output, from 10,000 to 6 million LS, averaged ~248,000LS, which would be more impressive if the average net export level was not 533,000LS. My home is not be a typical one. 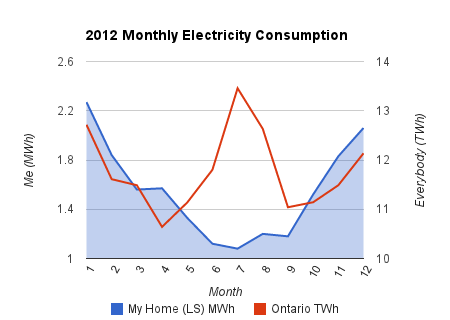 In 2012, the electricity usage Hydro One charged us for was 18.6 MWh  - based on the number of residential customers in Ontario that would push the residential share of consumption to ~60%, when I'd expect it to be closer to 40%; put simply, the LS home unit probably uses ~50% more electricity than the average home. We probably also use less energy despite using more electricity - the distinction being our home's water and space are heated without other energy sources such as natural gas, oil or propane (a wood stove does contribute to our space heating). While our house is atypical in it's heating, the big difference in the monthly trends between our home and the total province is seen in the summer months. As our house does not contain air conditioning, the heat of the summer is a clear signal to emit as little heat as possible within the house. On a provincial level, Ontario moved from a winter peak to a summer peak some years ago - which likely reflects both an increased penetration of air conditioning and an increase in population in more densely populated areas (with windows on four sides of the house, and a not particularly noisy area, living without air conditioning is much easier in the small town than it is in the large city). 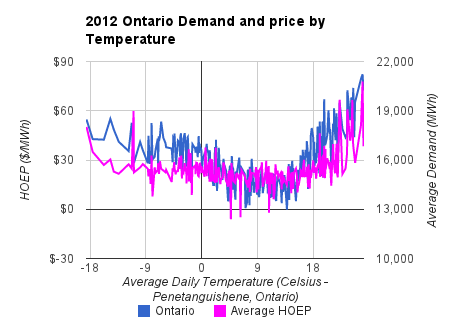 While the Hourly Ontario Energy Price (HOEP) does move somewhat higher during days with increased heating hours, the main correlation is to cooling degree hours. 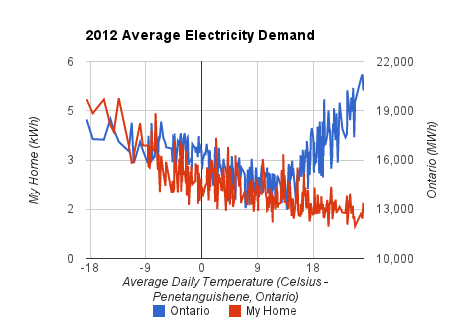 Over the course of 2012, the average market (HOEP) rate weighted to my home's usage was $24.37/MWh, which was slightly higher than the weighted average for the whole province (~$24.09). My hourly charges, based on regulated time-of-use prices set by the Ontario Energy Board, averaged $77.68/MWh. The difference in value between the prices I paid should equate with the global adjustment (which charges for the difference between what the market valued supply at and what the government had contracted it for) - and it actually does! My share of demand was ~0.00000013, and my share of the global adjustment was ~0.00000015. GA amounts for Class A customers will now be based on the percentage that their peak demand contributes to overall system demand during the five peak hours of a defined Base Period. For example, if their demand is assessed to be responsible for one per cent of peak demand during the five peak hours of the Base Period, they will be charged one per cent of the total monthly global adjustment costs throughout the subsequent billing period (called Adjustment Period). The Class A customer was created as large industrial users were abandoning Ontario for cheaper jurisdictions - the justification was that in cutting their usage during the peak periods they could benefit from reduced electricity costs, and others benefit as the system would avoid procuring additional generation capacity to meet peak demand. Regardless, using the Class A rules, and the currently listed top 5 demand peaks, my share of the global adjustment would have dropped almost 70% in 2012, and ~58% in 2011. I have calculated the price of my being placed in the lowest class, paying the captive regulated price plan time-of-use rates, and having the rules that the Class A entities designed for themselves not applied to my home, is $1,153.18 (2011 and 2012). The Ontario Energy Board is unlikely to support my argument. Late today - the day before Good Friday and the Long Easter Weekend - they released a ruling directing the lifting of another $50 from captive ratepayers to feed a "smart meter entity" - as if smart spending on operations was simply supposed to extort money from a captive client base instead of the investment performing to increase efficiency and improve the organization's value proposition. They charge for line loss as consumption - and then they charge for delivery based on the consumption. are a great author.I will be sure to bookmark your blog and definitely will come back at some point. I'm new to building web sites and I was wanting to know if having your site title related to your articles and other content really that vital? I see your title, "Blogger: Cold Air " does appear to be spot on with what your blog is about however, I prefer to keep my title less content descriptive and based more around site branding. Would you think this is a good idea or bad idea? Any kind of assistance would be greatly valued. owners. It really is a win win situation! 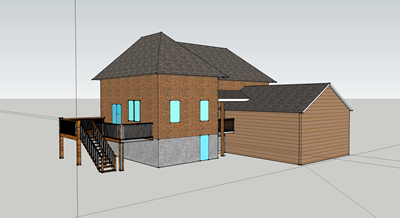 If you're interested feel free to e-mail me at: clarissa.plunkett@aol.com so we can communicate further. Appreciate it!